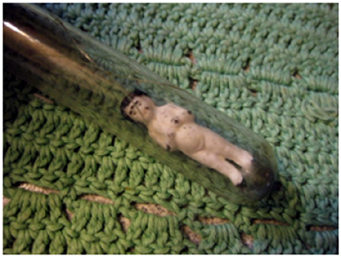 After finding a tiny white china doll inside an old glass jar at the bottom of a box in an antique shop I was compelled to find out what this little doll was and where it had come from. 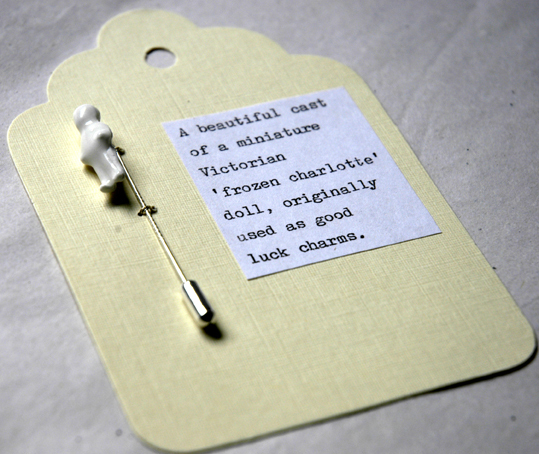 After completing some research I found out what I had come across was a ‘Frozen Charlotte’ doll. 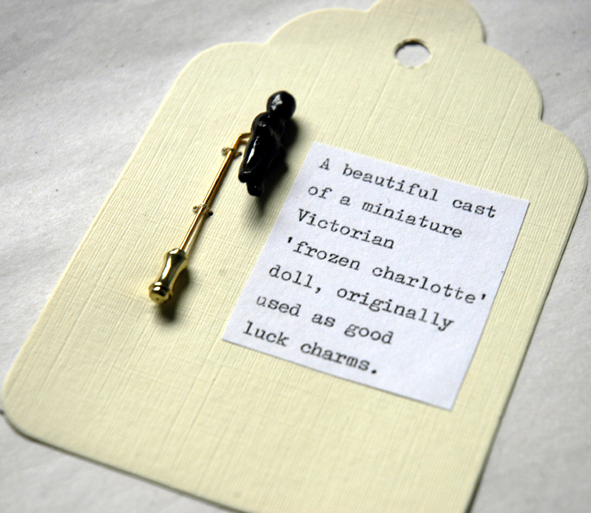 Frozen Charlotte is a name used to describe a specific form of china doll made between 1850 and 1920. The un-joined dolls take their name from a folk story about Fair Charlotte, which is a cautionary tale concerning a young girl called Charlotte who refused to wrap up warmly to go on a sleigh ride to a New Year’s ball, and froze to death during the journey. The dolls ranged in size from under an inch to 18 inches plus. The smallest dolls (like mine) were used as charms in Christmas puddings. 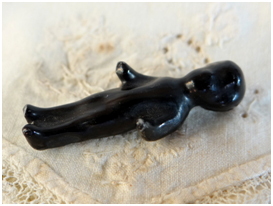 Sometimes only glazed on the front they would float in water so children often took them in the bath. A black version of the tiny china doll. My tiny little doll became a good luck charm; I wanted to incorporate this narrative into my work so I designed these Frozen Charlotte pins in Sterling silver and gold. The wearer can carry the tiny doll as a good look charm on their person. Bone china sterling silver ‘Frozen Charlotte’ pin. Black clay gold ‘Frozen Charlotte’ pin. I love antiques,especially ones with strange or interesting stories about them.